How Long Can A Spinoff Like ‘Better Call Saul’ Last? When I think of television spinoffs, I think of failure. I ponder the strange case of “Joey” — which lasted only 46 episodes after the 10-season, 236-episode run of “Friends” — or “Beverly Hills Buntz” — which fell on its face after nine episodes, failing to eclipse the 146 episodes of “Hill Street Blues.” Or better yet, I don’t think of them at all. My memory of most spinoffs is vague, a hazy recollection of failed attempts to maintain the magic of a beloved, or at least long-lasting, TV series. But something about spinoffs captivates us — a mix of the familiar and unfamiliar, scrambling our sense of a fictional world we thought we knew. Joey lives in Los Angeles now? The “M.A.S.H.” doctors work in an American hospital now? Last month, AMC introduced its highly anticipated “Breaking Bad” spinoff, “Better Call Saul,” and scrambled our notion of Saul Goodman. (His name is really Jimmy McGill?!) “Breaking Bad” was one of the rare TV series to depart well before staleness had set in, and its absence has left viewers hungry for more of Vince Gilligan’s dark, brutal, bleakly comic world. They’ve responded by devouring the show: Its third episode attracted 5.84 million viewers, good for second place among all cable programs, and a 500 percent increase for AMC in the Monday-night time slot. Promising — so promising that it’s tempting to think that “Better Call Saul” could somehow live longer than “Breaking Bad.” But if it did, “Better Call Saul” would be one of only a few spinoffs to air more episodes than its parent. The logic of spinoffs seems sound: If viewers liked a character in one place, why wouldn’t they also like him or her in another? But TV history hardly obeys logic. We often do not want more of the same, do not want to be lulled into accepting a knockoff version of an admired original. (No, “The Lone Gunmen” will not serve as an acceptable substitute for “The X-Files.”) Creating a hit TV show is an act of attempted alchemy. The same elements may on one occasion create gold and on the next brass — imitation brass, slightly chipped. * Show is still on the air. The average spinoff (“Port Charles” not included) lasted 68 episodes, and its parent series ran an average of 171 episodes, meaning that we can expect the average spinoff to run 40 percent of the length of its originator. The spectrum was wide, though. Some shows, like “Beverly Hills Buntz” and “Bewitched” spinoff “Tabitha,” barely lasted 5 percent of their parents’ runs, while others, like “Frasier” and “Golden Girls” offshoot “Empty Nest,” were on 98 percent as long as their predecessors. The rarest category: spinoffs whose runs exceeded those of their originators. 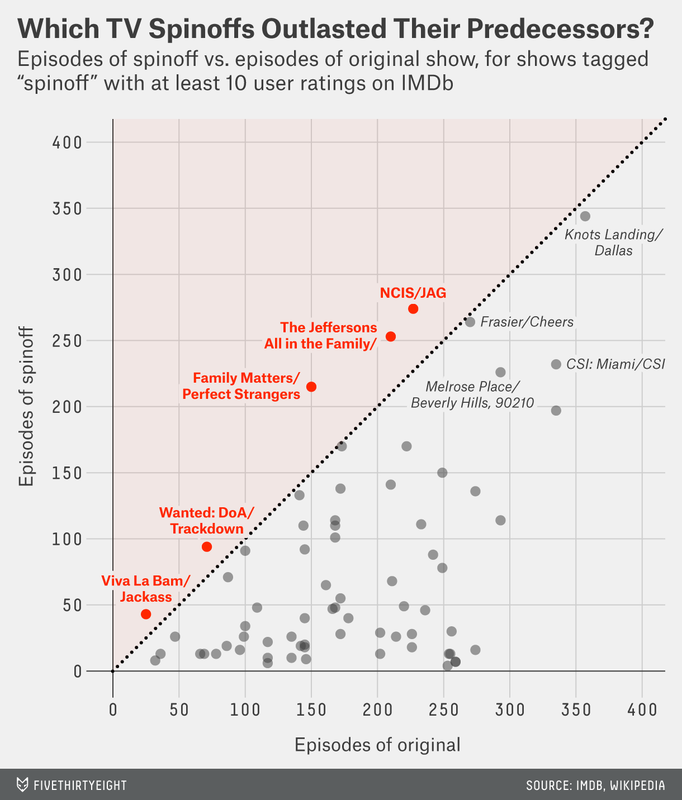 Only five shows were in this category — “Family Matters,” “The Jeffersons,” “NCIS,” “Jackass” spinoff “Viva La Bam,” and the little-remembered Western “Wanted: Dead or Alive.” Most shows, though, fell into the comfortable middle of moderate success, their runs lasting between one-third and two-thirds as long as their originating series. Based on precedent, we can expect a spinoff of “Breaking Bad,” which ran for 62 episodes, to run for about 25 episodes — two seasons, give or take, by cable standards. But “Better Call Saul” is a different, more retro, spinoff, one that maybe shouldn’t be judged the same way as most contemporary spinoffs. The first wave of spinoffs came in the 1970s, when successful sitcoms seemed to give rise to new series like snakes sloughing off dead skin. Characters were TV royalty, carried over from one series to the next in the hopes of preserving and sustaining the fragile magic. Today, a spinoff is often part of a larger brand: Five of the 11 post-1990 spinoffs to run more than 100 episodes are procedurals, including the long-running: “CSI: Miami” and “NCIS.” Procedurals replicate themselves with ardor, bouncing from city to city and department to department while closely following the original’s formula. “Better Call Saul,” which stars Bob Odenkirk, feels like more of a throwback to the 1970s spinoff model than the contemporary procedural model, celebrating character as much as atmosphere. Saul Goodman was the stealth favorite during the celebrated run of “Breaking Bad,” and cashing in that chit with an Odenkirk-focused show is a retro move, with Gilligan and AMC aping the 1970s sitcoms of Norman Lear (“All in the Family” and its numerous spinoffs) and Grant Tinker (“The Mary Tyler Moore Show” and its offshoots) more than “CSI.” “Better Call Saul” is a relic. But would you really want to bet against Saul Goodman? CORRECTION (March 3, 3:45 p.m.): An earlier version of this analysis misstated the average length of spinoffs and their parent shows. The original calculation included shows that are still on the air, but it should not have. The article has been updated throughout.